Now you don’t have to wait until Sunday to play the next Sunday Crossword Puzzle. 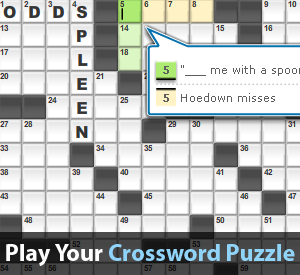 Here at Webcrosswords.com have have collected hundreds of free Sunday Crosswords so sit back tie on your thinking cap and enjoy because here, every day is Sunday! Doing the crossword puzzle on a Sunday morning has become a tradition. 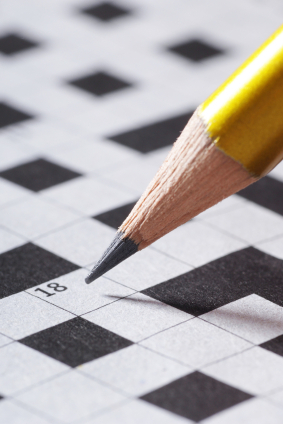 These crossword puzzles evoke wonderfully lazy images of working on clues over morning coffee, or a reliable loved one who always chimes in on the clues that don’t come to mind. People who create crossword puzzles are formally called “cruciverbalists,” but what do we call our crossword puzzle enthusiasts? The first crossword puzzles were created in the late 19th century, but by the early 20th century they were beginning to appear published in newspapers. The Boston Globe published its first crossword in 1917, and by the 1920s crosswords became a full-blown craze. Though a major publisher of crossword puzzles during our contemporary times, The New York Times was slow to hop on the bandwagon. Their staff opposed to crosswords, considering them a frivolous waste of newspaper space. It wasn’t until 1942 when the New York Times published its first crossword puzzle. Now, the Ne York Times produces some of the most prestigious crossword puzzles available, including its Sunday crossword puzzles into the New York Times Magazine insert to the Sunday paper. The challenge of the puzzles are intended to scale up over the course of the week, with the Friday and Saturday crossword puzzles providing the most challenge. In The New York Times, the challenge of a crossword puzzle is denoted with stars, the greater number of stars, the greater the challenge. In addition to the Sunday crossword puzzles, The New York Times also provides an “alternative” puzzle on Sundays and the type of the puzzle changes every week. The author, or “cruciverbalist,” who holds the records for authoring the greatest number of Sunday crossword puzzles for the New York Times is Jack Luzzato, who single-handedly constructed 119 puzzles. In addition to the New York Times, the Sunday crossword puzzle is syndicated in over 300 other newspapers. The current In addition to the New York Times, other papers that famously produce Sunday crossword puzzles are The Los Angeles Times and USA Today, and The Washington Post, The Wall Street Journal and even The Onion. Often the clues to a crossword puzzle are quirky or indirect, adding to the challenge of the puzzle. The clues to a crossword puzzle may also all be connected by a single theme, such as around a holiday or a celebrity’s birthday. Sunday crossword puzzles are an iconic tradition in the United States. Unfortunately, the “Daily Crossword” has been stuck on the same puzzle for the last 5 days. This is not the first time this has happened, either. “Daily”? I think not! Seems the LA Times crossword is still stuck on April 13. Enjoy the crosswords, keep up the good work! trying to get the Sunday Crosswords, but it is not letting me get there…keeps taking me back to the dailys that i have already done. Hi, they are the same. Hi! Hate to be obtuse, but I don’t understand your answer to Dusty’s question. I can’t find any Sunday puzzles, either. Daily puzzles, no problem – Sunday puzzles, no can do. What is the secret to finding and opening previous Sunday puzzles? Thanks. The crosswords are up to date? Fix the LA Times Crossword. It’s been stuck on April 28th. Please! Archives area says to use the Previous and Next buttons above, but I can’t find them. Otherwise, thanks for fun site! The LA Times crossword puzzle has been stuck on June 12. Could you please fix it and why can’t we get back puzzles on this one? Easy crosswords is still not fixed! It’s fixed now. Thank you. I don’t see the LA Times puzzle for this past Sunday, June 26th. Was it posted? Also, in the LA times puzzle for Sunday, June 19th, there were clues missing again (as there were on June 12th, and I commented on it. You replied that my comment would go to the appropriate department). Last week, it was 82, 83 and 84 Down that were missing. Again I got the words from the ones going Across. This week the whole puzzle is missing! Please have the “appropriate department” do something about this. Please refresh your daily? crossword and LA times crosswords. This problem is really frustrating to those of us who enjoy them. Technical issue, all fixed now. Sorry! The LA Times crossword is still stuck on Sunday. Vary frustrating! This is fixed now. Sorry, we have been having some issues with our crossword provide we purchase the puzzles from. Please fix LA Crosswords. Its stuck on Sunday and is there any way we can get the missed puzzles like you can on Daily Crosswords? Thank you! Fix the date. As for the missed puzzles we will look into this for you. WELL,LOOK WHOSE BACK IHAVE BEEN VERY,VERY SICK !! !YOU STILL MAKE THE CROSSWORDS ANYWHERE!!!!!!!!!!! !I ENJOY ALL YOUR PUZZLE AND CAN NOT WAIT TO DO THEM! KEEP UP THE GREAT JOB YOU ARE DOING. The LA Times puzzle has been the same for 2 days. Fixed. Thanks for letting us know. When I print out the sunday la crossword, there are clues missing from the down list–never the across. Why is this and can it be fixed? This has happened every week since i found your site! Also, it is very frustrating when the same puzzle stays up for days…other than that, I love the site and thank you for a place to go to for quality crosswords. Hi Stephanie, I’ve sent you a email about the printing. I don’t like the new format for the LA times Sunday Crosswords on the web site. The old format was so much more readable. Sorry, but I miss the previous crossword format, I used to do it daily and Sunday…why’d you guys change it? We haven’t changed any of the formats in recent times, have you tried our other crosswords? Easy crosswords and daily crosswords. The down clues in the daily crossword have not appeared in the last 2 days. Please fix this. Thanks. This has been fixed thanks.